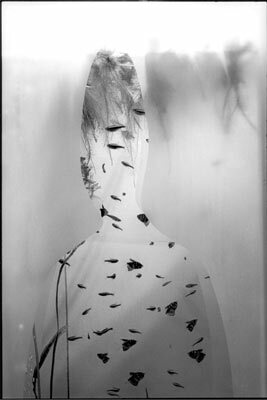 The June Bateman Fine Art is pleased to announce a one-woman show of the photographs of Sylvia Plachy. VERSO: A Retrospective With a Different Point of View, Photographs 1964 - 2002 opens on October 24 and will run through November 30, 2002. For over twenty years Sylvia Plachy has been recognized as one of the most important contemporary photojournalists and street photographers. Unguided Tour, her 1990 monograph, is considered to be one of the most important photographic books of the past twenty years. Plachy's subjects are innumerable, and she uses a range of approaches and formats that is commensurate with a body of work that seeks to encompass much of human reality in a series of insightful, and often witty, glances. Best known for her eccentric but perfectly framed and focused compositions, Plachy often uses a touch of lightness reminiscent of her friend and mentor Andre Kertesz. VERSO will, quite literally, show another side of Plachy's work. The show gathers over forty images taken around the world that demonstrate the expressive nature of the backs not only of people but also animals. Through Plachy's lens this eccentric view of things brings a new and unfamiliar perspective to the world. As always, Plachy approaches photography in a playful manner while using playfulness to create work of unexpected depth and beauty. Sylvia Plachy was born in Budapest, Hungary and lives in Queens, New York. She studied photography at the Pratt Institute and launched an extremely successful career as a photojournalist. Perhaps best known for weekly pictures for the Village Voice, her photographs have appeared in over 50 major publications, including Aperture, Artforum, Grand Street, Granta, The New Yorker, the New York Times Magazine, Travel Holiday, and Wired. Her books include Unguided Tour, which won the ICP Infinity Award for best publication of 1990, Red Light (1996), a collaboration with writer James Ridgeway, and Signs and Relics, published in 1999. She has exhibited widely, including shows at The Minneapolis Institute of Arts, MOMA and the ICP. Her numerous solo exhibitions have included shows in Paris, Tokyo, Budapest, Chicago, Berlin and New York. Sylvia Plachy's work is in the permanent collections of MOMA, the San Francisco Museum of Fine Art, the Minneapolis Institute of Arts, the Metropolitan Museum of Art, and the Bibliotheque Nationale. She has been awarded a Guggenheim Fellowship and has had a CAPS Grant. Richard Avedon wrote of Unguided Tour: "Not since Robert Frank's The Americans have I experienced a body of work of such range and power. She makes me laugh and she breaks my heart. She is moral. She is everything a photographer should be."